Follow OSU in the 2008 North American Solar Car Challenge. Designing and building a solar-powered car fit to take on the North American Solar Challenge took OSU Solar Vehicle Team captains and College of Engineering doctoral students Kathy Van Wormer and Hai-Yue Han three years of work and $50,000. They also enlisted the help of nearly two dozen team members to make sure that Rain Dancer, which is powered by more than 400 solar cells and weighs 600 pounds, was competition-ready. But that was only the beginning of their trip. Rain Dancer’s solar array only outputs around 1.5 hp during the brightest time of the day, forcing it to drive more than 2,000 miles with less power than a hairdryer. 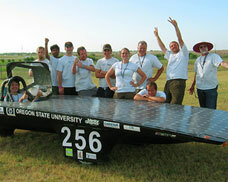 Follow the OSU Solar Vehicle team’s progress in the race on their blog. Posted in Energy and Sustainability. 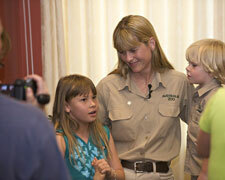 Terri Irwin partners with OSU for humpback whale research. Terri Irwin’s relationship with OSU’s Marine Mammal Institute, which led to a recent agreement to fund two humpback whale research projects, began by happenstance. The Institute’s director, Bruce Mate, had written to Irwin to express his condolences over the death of her husband, the Crocodile Hunter Steve Irwin, and she picked Mate’s letter from the piles of correspondence before her. But Mate had another purpose. He was also writing to express his thanks for the Irwins’ support of his research. Before his death in September 2006, Steve Irwin had planned a research trip to Antarctica. After he passed away, his family learned that the arrangements could not be canceled. The Irwins had their ship captain offer the trip to another scientist at minimum cost. The captain reached out to Bruce Mate and his MMI team. Irwin wrote back, telling Mate about her interest in whale conservation and research. She invited Mate and his wife to Australia to discuss the possibility of working together and to visit the Australia Zoo, which the Irwins own. The agreement with MMI is Irwin’s first of this kind with an American university and a way to honor Steve’s memory. “After we lost Steve, I made a decision that I would tackle everything that Steve had planned for the next 10 years,” she said. Whale conservation, which Steve Irwin was passionate about, was on the list. Compared to culling or harvesting whales, the non-lethal methods used by OSU’s Marine Mammal Institute to study humpback and other whale species, she says, can provide much of the same information. “Learning about whales is part of a bigger picture. Our oceans are in jeopardy and the more research we gather about whales, the more knowledge we have to help us save, protect and preserve our delicate oceans,” she said. In September, Mate, his research team and Australia Zoo will collaborate on a project to tag up to 25 humpback whales near Unimak Pass at the eastern end of the Aleutian Island chain. During that time, huge concentrations of krill develop in the region, drawing millions of seabirds and hundreds of whales of many species, including the threatened humpback. The goal of the project is to tag the humpbacks, to determine how much they intermingle in the feeding area and to track the timing, route and rate of speed for their migrations back to their respective breeding areas. In October, the team will also travel to the tropical South Pacific where the scientists will tag humpback whales at American Samoa near the end of the animals’ reproductive season. Satellites will track the spring migration to Antarctic feeding grounds. The research will shed light on the whales’ movements, possibly around the other islands of Oceania and where they go in Antarctica to feed, Mate said. Posted in Marine Science and the Coast. Voracious “red devil” squid are on the move. It was like a scene from a grade-B horror film. On a gently rocking vessel in the warm waters of the Sea of Cortez, a young oceanographer earnestly watches her computer screen while colleagues lower a cable into the water. Instruments aboard the ship, the Pacific Storm, ping sound waves toward the cable. The oceanographer’s eyes flicker across the screen to make sure the signal is clear. 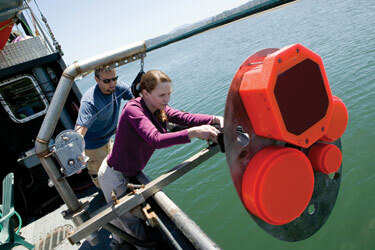 Tethered to the cable is a 5-pound Humboldt squid, and the sound waves, set at 38 kilohertz, bounce off the squid. An image shows up on the screen. The oceanographer raises her fist in triumph. It marks the first time scientists had clearly picked up a strong sonar signal for squid, which lack the bones and swim bladders that give away other marine creatures. Suddenly a second image appears, darting up from below. The acoustic signal tracks it from the depths toward the cable — and the tethered squid. It is another squid, larger than the first, and it attacks the tethered animal. The oceanographer screams. Read the rest of the story on Kelly Benoit-Bird and her research on squid in the Summer 2008 issue of Terra. 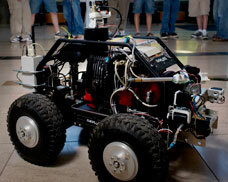 OSU’s Robotics Team Takes First in National Competition. 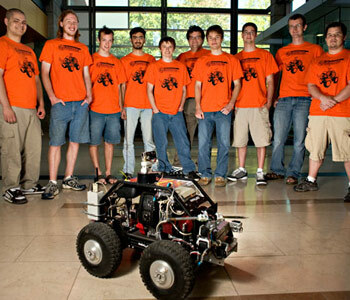 The core members of the OSU student team that won the 2008 University Rover Challenge could have been characters in an action movie. There was Ben Goska, who’s been programming computers since the age of 10, and Jordan Levy, who’s been assembling gadgets for just as long. Ryan Albright knows mechanical design software and how to manufacture professional-grade parts. Matt Shuman organized the group and kept their goals in focus. All four are students in OSU’s College of Engineering and members of the OSU Robotics Club. Their challenge was to brave the harsh, Mars-like terrain at the Mars Desert Research Station in Utah. They outstripped the competition when their “Parallax Quad-Rover” beat teams from the University of Nevada, Georgia Tech, Iowa State, Brigham Young University and others. “The rover competition promotes innovation within engineering, challenging engineers to find solutions that improve their engineering abilities,” says Shuman. The team adapted their rover to perform tasks such as construction, soil analysis and navigation in extreme conditions. The event that helped the OSU team clinch victory was finding and delivering supplies to a “distressed astronaut” — in this case a real, but empty astronaut suit lying on the desert floor. The team’s Quad-Rover used a gasoline-powered hydraulic drive system, the first of its type ever used in this competition. It provided far more power than some of the other systems that were run on electrical batteries. “We were able to go over and through rocks instead of weaving around them in places where many teams got stuck,” says Shuman. It still wasn’t an easy process. “We made a firm commitment to publicly showcase our rover a month before Utah,” says Shuman. “But the dress rehearsal failed horribly.” Once the team got the wheels of the rover moving and increased the throttle, the gasoline engine shook so much it disconnected a vital power cable. The pitfall motivated them to find and fix problems, which was crucial to their success. It also made them realize that they needed to bring in more varied talents before the competition. “Anyone with enough motivation was welcome to help, says Shuman. Nearly a dozen did, supplying the team with t-shirts, maps of the Utah terrain and even expertise in constructing robotic arms. Most were engineering students also involved in OSU’s Robotics Club, and several accompanied the original team members on the 16-hour drive to Utah. The team credits the Oregon NASA Space Grant Consortium, Parallax, Inc., a Sacramento, Calif., robotics firm and AJK Sheet Metal with providing sponsorship and valuable parts. Design instructor Donald Heer also helped the team stay on course. 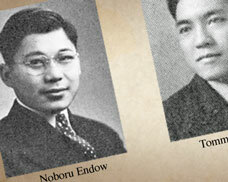 OSU honors WWII-era students of Japanese ancestry. When Japan bombed Pearl Harbor on December 7, 1941, the lives of 42 Oregon State University students of Japanese ancestry changed irrevocably. All of them were forced to leave school during World War II because of President Roosevelt’s signing of Executive Order 9066. Many ended up in internment camps, and most were unable to return to OSU to complete their degrees or participate in commencement. Now, more than six decades after the end of the war, those students will be recognized at OSU’s June 15 commencement ceremony. Most of these former students since have died. But several will return to campus and many others — both living and deceased — will be represented by family members during the ceremony, where they will receive their honorary degrees. One of those students is Noboru Endow, who was a sophomore studying chemistry when Pearl Harbor was bombed. Even though Endow was harassed in his dorm immediately afterward, he never wanted to leave OSU. But the choice wasn’t his to make. In the spring of 1942, he received an official letter informing him that he had five days to leave campus and board a bus that would take him to a Portland detention center. He was devastated. 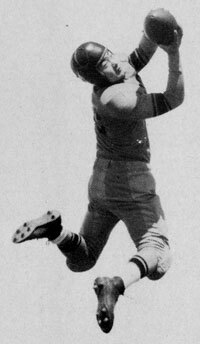 After spending a couple of days at the center, Endow was sent to a sugar beet farm in eastern Oregon and was later allowed to attend the University of Utah, where he earned his degree in chemistry. Endow, who is 85 and now lives in Santa Clara, Calif., thinks it is important for OSU to be granting the degrees. “It’s good that they are having this to recognize people who were studying, and it is worthwhile for everyone to recall those events. It’s hard how government acts during war. You want to be patriotic, but also reserve judgment; you can lose your civil rights easily,” he says. The impetus for granting the degrees came from two OSU students, Andy Kiyuna and Joel Fischer. Both played key roles in pushing the idea for such action into law, and state representatives Tina Kotek of Portland and Brian Clem of Salem co-sponsored the bill. In may of 2007, Gov. Ted Kulongoski signed Oregon House Bill 2823 into law, granting honorary college and university degrees to former students of Japanese ancestry who were displaced by the war. 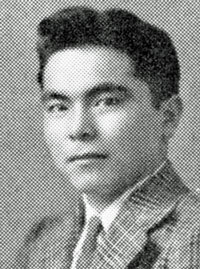 On December 12, 1941, a mere two months before Executive Order 9066 went into effect, many of OSU’s students of Japanese ancestry, including Endow, composed, signed and sent a letter to then OSU President F.A. Gilfillan. They wanted to assure Gilfillan of their loyalty to OSU and their pride in their country. “We will deeply appreciate any opportunity to prove our mettle and our devotion to the College and to our State and Nation. We hope that the trial of this supreme national test will prove a unifying and enlightening influence upon all Americans and their resident relatives from foreign lands,” they wrote. After 65 years, their sentiments will finally be honored. Photos for this feature were generously provided by OSU Libraries University Archives. 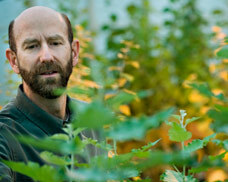 Distinguished Professor Steven Strauss focuses on research and outreach. It’s the kind of image he breaks out when he wants to help establish a bond, to show young activists that he can relate to them and their concerns. The picture helps Strauss explain that his research has taken him down a long, still evolving path. After all, Strauss’ professional life is bound to be contentious. He uses the tools of biotechnology to, among other things, turn poplar trees into more efficient wood and energy sources. His accomplishments at the intersection between research, outreach and mentoring have earned Strauss the title of “distinguished professor,” the highest honor a faculty member can receive at OSU. “His scholarship is broad, spanning the molecular to the ecological, and technical to policy levels,” wrote Tom Adams, department head of Forest Science, and Steven Hobbs, Executive Associate Dean of Forestry, in nominating Strauss. “Dr. Strauss’ laboratory has trained more than 150 high school and undergraduate students, 21 postdoctoral scientists, 39 technical/professional employees and 23 graduate students. Most of his graduate students have earned leading positions in academia or industry,” they added. In some ways Strauss sees himself as another kind of plant breeder, albeit on a microscopic level. In his research, Strauss has looked at poplars from many sides. Sometimes he tries to create trees that are more resistant to drought, or more tolerant of shade or salty soils. Sometimes he looks for ways to make trees generate better feedstocks for ethanol production. But one of Strauss’ major research goals has been creating trees that don’t flower at all — to minimize ecological concerns of genetically modified trees. In short, he’s one of the world’s foremost genetic architects of the arboreal world. According to Strauss, it is crucial to pay attention to biotech. 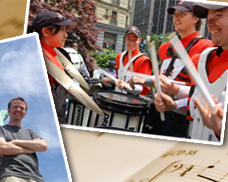 OSU Band member Branden Hansen plays New York. On May 30 the OSU Wind Ensemble and Pep Band traveled to New York City to perform at Carnegie Hall and Greeley Square. Below is band member Branden Hansen’s account of his New York experiences. The moment we stepped off the buses at our 38-story Manhattan hotel, we forgot the sleep we lost on our red-eye flight to New York City. Taxi cabs, skyscrapers, street vendors selling cheap sunglasses and knock-off purses, bustling sidewalks, a brilliant blue sky and an unforgettable urban odor with hints of hot dogs and the day’s garbage filled our senses. This was our home for an exhilarating, all-too-short weekend. After unloading our luggage into the hotel, we broke into small groups and invaded the Big Apple — if 99 Beavers losing themselves in a city of 8.2 million is an invasion. We only had one full day as tourists, but my friends and I managed to see Ellis Island, the Statue of Liberty, Ground Zero, St. Patrick’s Cathedral and Times Square. But no tourist activity topped seeing “Chicago” in the fourth row of the 87-year-old Ambassador Theatre. These experiences showed me why people love the city so much. They also prompted me to purchase my own, not-so-unique “I Love NY” shirt. New York City as the OSU Band saw it. In the background, the Wind Ensemble plays “Gusto El Sabor,” one of the songs they performed at Carnegie Hall. After resting and a few hours of sightseeing, the members of the OSU Pep Band geared up for their performance at Greeley Square. I threw on my orange and black uniform, grabbed a pair of drumsticks and boarded yet another bus. I still found vehicular sleeping to be virtually impossible. Heads turned as we unloaded our instruments. Passersby probably thought that this was one of the strangest spring Halloween parties ever. Once the band started pouring out melodies and drum grooves though, people flocked to the square to listen. We had a great time filling this pocket of New York with tunes like “All Right Now,” “Fat Bottom Girls” and of course the OSU Fight Song. This performance was exciting, but it was only a prelude for what followed. This was why we had come to New York — our 8:30 p.m. performance at Carnegie Hall. The Wind Ensemble was teeming with anticipation all day. But I had a serious problem: I couldn’t find my music. With only 30 minutes left before we loaded the buses, I was beyond frantic, thinking, “I am going to die, and then my conductor will kill me.” After the fifth time checking my briefcase I finally found my music…right where I had left it. The atmosphere in our dressing room was charged. Some practiced difficult measures while others looked at the photos of great performers and ensembles that lined the walls. Finally, we were led to the stage. Although we had little time to warm up before the concert, I knew we’d spend a few minutes soaking in Carnegie’s aura. Many have seen Carnegie’s ornate, white and gold architecture, but few have seen it from a performer’s perspective. The lights dimmed and the concert began. Playing at Carnegie, in this incredible city, had put me into a strange musical auto-pilot. I wasn’t thinking about performing. I couldn’t think about performing. The experience was overwhelming. As we played our final notes I was at last able to take control of my thoughts again and realized that the audience had risen to its feet in applause. As I looked across the stage, I saw my colleagues’ faces streaming with the tears. This was an experience and an event none of us will forget. Michelle Inderbitzin and her colleagues focus on the positives of youth development. In 1998, Michelle Inderbitzin decided to conduct a study of youth in a detention center for violent offenders. Almost every Saturday morning for 15 months, the University of Washington graduate student in sociology made the 90-minute drive from Seattle to an “end-of-the-line training school” for boys convicted of multiple property crimes, armed robberies, violent and/or sexual assaults and homicides. At first, the reception was cold. Inmates ignored her, later saying they expected her to give up and leave. Eventually one of the older youths, a 19-year-old Hispanic boy respected by the others, approached her and began to talk. Gradually, others followed, sharing details of their lives, their dreams, frustrations and unsettled scores that awaited them back home. Now an associate professor of sociology at Oregon State University, Inderbitzin shares her knowledge with OSU students through courses on criminal justice and deviant behavior. 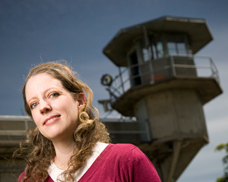 In 2007, she became the first university professor on the West Coast to lead a class of students and men’s prison inmates through the national Inside-Out Prison Exchange Program, which promotes understanding of the criminal justice system. Inderbitzin and her colleagues at OSU are tackling some of the most pressing challenges that confront families and youth: the development of positive behaviors; the channeling of youthful energy to meet community needs; the lengthening transition to adulthood. Read more about Michelle Inderbitzin and her colleagues in the Summer 2008 issue of Terra. John Frohnmayer’s musical SPIN shows what can happen when personalities clash — over art. Put a controversial performance artist, a conservative U.S. Senator, the chair of the National Endowment of the Arts and a preacher named JoeBob into a room together to discuss art and politics, and the resulting personality clashes are sure to generate comedy. That’s what John Frohnmayer had in mind when he wrote SPIN, a musical that depicts the early ‘90s “culture wars” that pitted artists seeking complete freedom of expression against those who demanded stricter rules for federally funded art. SPIN made its first run at Oregon State University on May 8, and its debut was the product of collaborations throughout OSU and beyond. Director Marion Rossi Jr. has helmed more than 30 OSU productions as an associate professor of speech communication. Music instructor Sila Cevikce Shaman wrote SPIN’s compositions, and David Ogden Stiers, best known as Major Winchester on the television series M*A*S*H*, joins a cast of student and community actors. “To see a director like Marion Rossi, a veteran performer like David Ogden Stiers and some wonderful student actors bring SPIN to life and give it their interpretation is incredibly exciting,” says Frohnmayer. Rossi, who began workshopping the musical with his students in theater classes more than a year ago, says he’s loved witnessing SPIN develop. “It’s a great experience for the students — working on an original production, seeing how it grows, evolves and changes over time,” he says. For University Honors College senior Maarika Teose, who plays the outrageous and provocative performance artist Polly, that experience has been even more enhanced by Frohnmayer’s continuing input and presence at rehearsal. 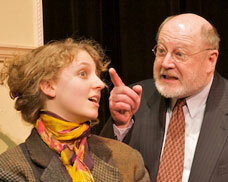 “This is the first play I’ve done that hasn’t been performed before, so having the playwright there is fantastic. If we have any questions about the script, or if something isn’t working, he can guide us or make changes,” she says. Teose says that Stiers, who joined the cast about a week after they began rehearsing winter term, is also a resource. “He’s fun. It’s really nice to have someone there who has a lot of real-world acting experience. He can give some really deep advice,” says Teose, who has been involved in OSU theater for the past five years. Stiers wanted to join SPIN’s cast because he feels strongly in freedom of expression. Likewise, Rossi hopes audiences leave SPIN with a deeper understanding of art’s importance in their lives. From coral reefs in the tropics to Oregon’s rocky banks, Mark Hixon investigates coastal marine fishes. OSU zoology professor Mark Hixon’s research on fish population dynamics has taken him to most of the planet’s oceans, both temperate and tropical. He’s dived in the Pacific, the Atlantic, the Caribbean and the Coral Sea. He’s graduated from the bone-chilling dives in cold-water kelp forests that he made as a doctoral student in the 1970s to using small research submarines in frigid northern waters. Hixon’s research is driven by a mystery relevant to both fisheries management and marine conservation — whether and how isolated populations of adult fish are linked. “One of the most important challenges in marine science today is to understand how the decline of a species in one part of the ocean affects the same species elsewhere — how spawning in one region replenishes populations in other areas,” says Hixon. In two ongoing studies — one in Hawaii, the other in the Bahamas — Hixon and his graduate students are investigating connections among isolated populations of coral-reef fishes. They are studying the demographics of the yellow tang on Hawaii’s Big Island and the bicolor damselfish in Exuma Sound off the Bahamas. They are sampling DNA from adult and juvenile fish at multiple reefs. Their goal is to understand the drift patterns of fertilized eggs and larvae that travel with tides and currents in a process known as “larval dispersal.” And they are testing whether a high level of larval connectivity between two populations is reflected in the population dynamics of adult fish in those populations. Ultimately, the answers will guide conservation and management, not only of fish, but of the reefs themselves. These complex ecosystems brim with more species than anyplace on the planet, even tropical rainforests. And many are dying. Pollution, global warming and overfishing have degraded about 20 percent of Earth’s coral reefs so far. Another 50 percent are at risk. In Hawaii, the yellow tang, coveted by the aquarium trade for its brilliant color, was depleted until the state created marine reserves along the Kohala-Kona coast of the Big Island to protect them. 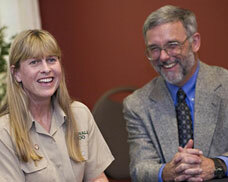 Preliminary data from Hixon and his colleagues suggest the reserves are working. “Comparisons inside and outside protected areas demonstrate that the reserves produce larger populations of spawning adults, and the aquarium fisheries are thriving as a result,” he says. The yellow tang genetics, still being analyzed in Hixon’s lab, will reveal which of Hawaii’s reefs need replenishment from spawn drifting in from highly productive “source” reefs and where those respective reefs are located. One of the world’s leading authorities on coral reefs, Hixon has been cited in scientific journals more often than any other coral-reef ecologist in the Western Hemisphere over the past decade, according to the Thomson Institute for Science Research. He was ranked third worldwide behind two scientists who live adjacent to coral reefs year-round.